Teenconsulting, your energy audit expert ! The energy audit involves analysing the current situation of your facilities and infrastrucutre so as to propose optimum solutions making it possible to improve the energy efficiency of your buildings. 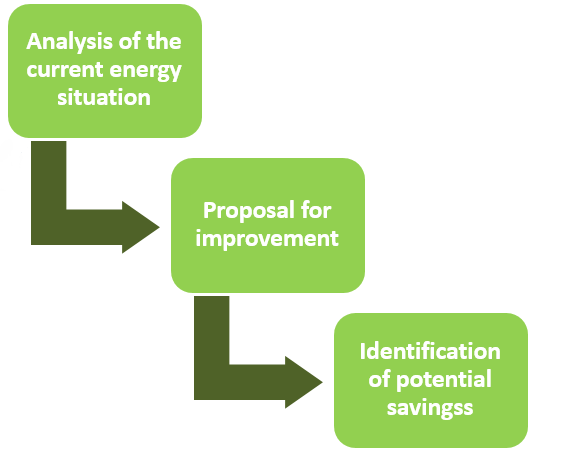 The audit provides feasible solutions to rationalise your consumption, through inspections, measurements, energy analyses and study, by proposing realistic and quantified avenues for improvement and by identifying the potential savings that can be achieved. The design, operating and safety faults observed are highlighted fr each chapter for the purpose of obtaining a preliminary glimpse of the building’s energy potential. Details are also provided about the available energies together with the last three years’ energy consumption. After having identified the biggest users of energy, Teenconsulting proposes a whole series of measures that can improve the building’s energy performance. The savings calcultations, feasibility and advantages are detailed for each measure.